Suriya to play son, father and grandfather role in Vikram Kumar's 24? 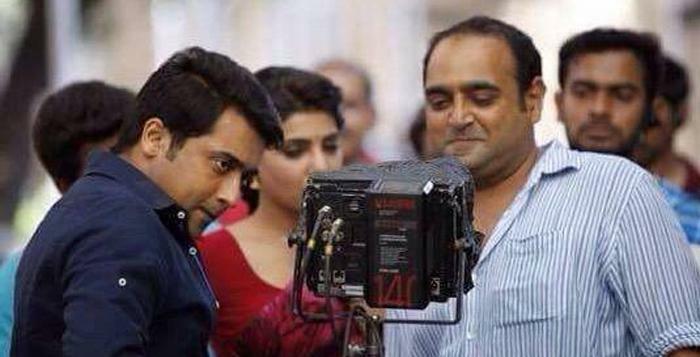 Home » Samantha | Suriya | Vikram K Kumar » Suriya to play son, father and grandfather role in Vikram Kumar's 24? Post the lack of commercial success of ‘Anjaan’ and ‘Masss’ looks like Suriya is pinning all his hopes upon his upcoming venture ‘24 directed by Vikram Kumar. The first schedule of the movie is already completed and the second schedule has already begun in Mumbai, India. The second schedule is said to last for 20 days. It’s been buzzed that Actor Suriya is adapting to the role of a three-fold in his next, as the son, the father and the grandfather. However official confirmation regarding the same is awaited from the crew. It is understood that as Vikram Kumar’s Manam was based on the relationship of three generations of a family, a section of media is speculating that Suriya is playing a triple role in the film. ‘24’ is directed by Director Vikram Kumar of ‘Manam’ and ‘Yavarum Nalam’ fame so expectations are soaring high for this project. The film has Samantha Ruth Prabhu playing the female lead. Actor Suriya has also managed to rope-in Oscar winner AR Rahman to compose music for the project. Let’s just hope it’s a blockbuster and gives Actor Suriya the break he deserves.We’ll keep you posted on further updates.